You truly could get lost in this abundance of Botanical beauty. The style Inspiration comes from the 19th Century explorer Hettie G Watson. Who travelled the world collecting exotic plants and flowers. 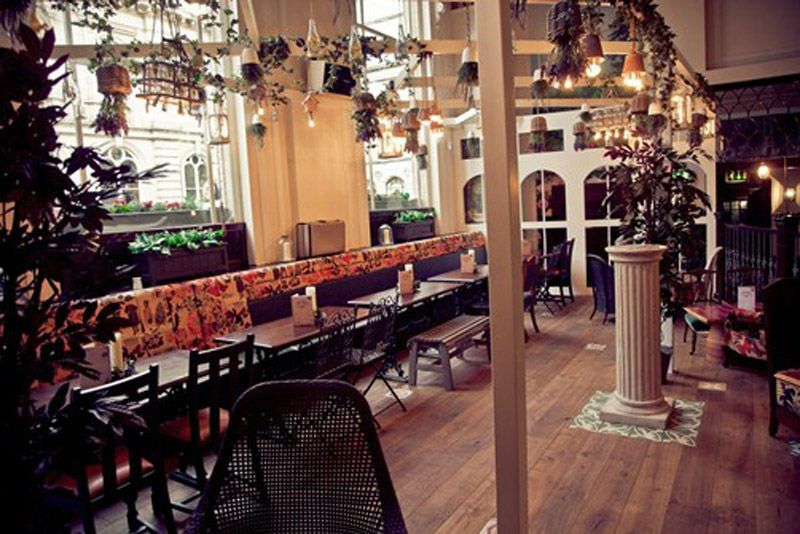 This amazing bar and restaurant is a Victorian hideaway of natural wonderment. Further more situated on the corner of Bennett’s Hill in Birmingham’s Business District. 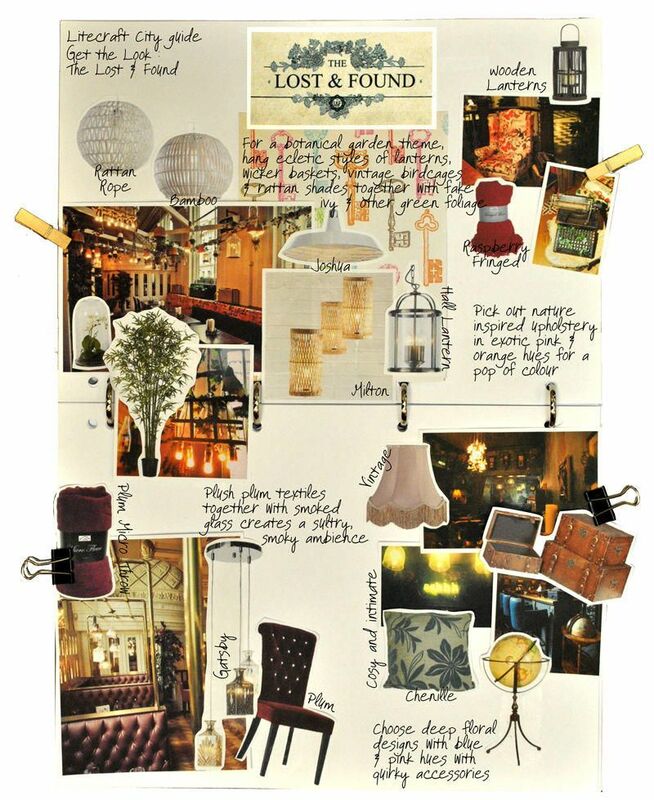 The Lost and Found is housed in a grade 2 listed building. Originally the National Provincial Bank built in 1869. The original features are still evident on entering. A large dome sits a top the entrance way. As a result revealing a brushed cream and gold finish. Also original filigree detail. The establishment consists of four areas. A sweet botanical garden library, adjacent to a plush dining area. A private boardroom which caters for meetings and a more intimate dining. Lastly a secret drinking den hidden beyond a bookcase. The first area you’ll come across is the large indoor garden. Thus featuring botanical beauties such as trails of ivy. Also a full length vertical wall garden. Lastly a relaxed seating area hidden beneath a rain forest canopy. Pretty tea light lanterns, upside down plant pots, hanging wicker baskets, glowing birdcages and a collection of butterflies are suspended above. Along the back wall is a pretty upholstered seating area. This features beautiful pink and orange butterfly detail. Armchairs with matching upholstery sit beside rustic typewriters. These are entwined with more leafy trails referencing Miss Watson’s stories. The other side of the domed entrance houses a more subtle décor. In addition smoke finished decanter glass pendants hang from metal piping. 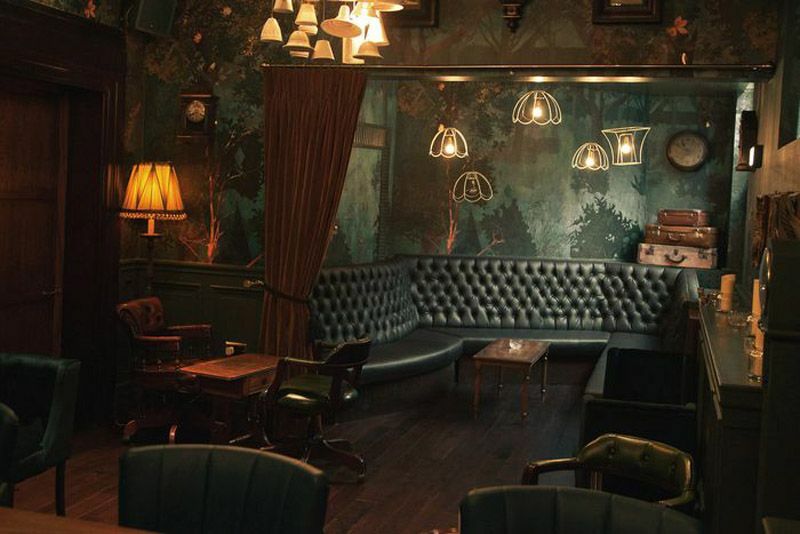 Thus over plush plum leather booths creating a sultry, smoky ambience. Whilst an apothecary cabinet houses individual up lit jars. This side of the venue conveys are more subtle classic feel. Yet still has evidence of Hettie’s explorations with portraits on the wall and more leafy features. 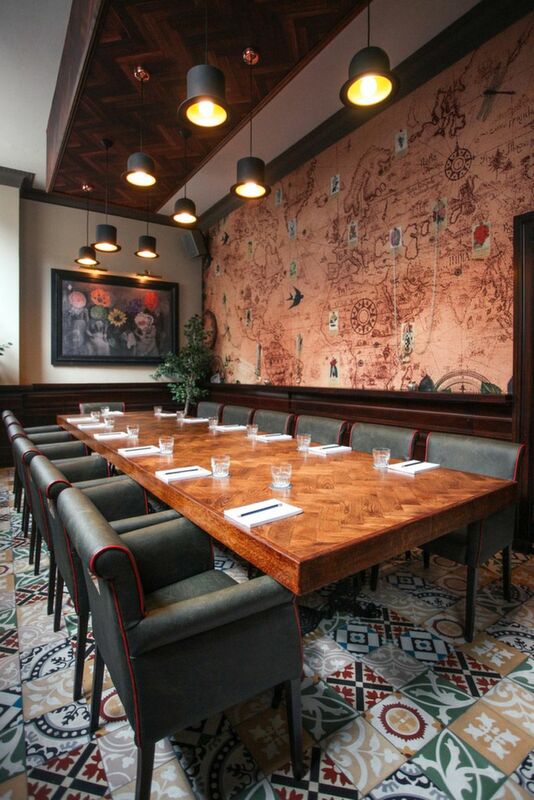 The boardroom boasts an intimate dining experience. Done in a trendy secluded setting. A homage to Hettie’s travels is shown on the man wall. Thus decorated with a full length world map it showcases her many adventures. This includes dainty postcards too. An eclectic array of vibrant coloured tiles cover the floor. 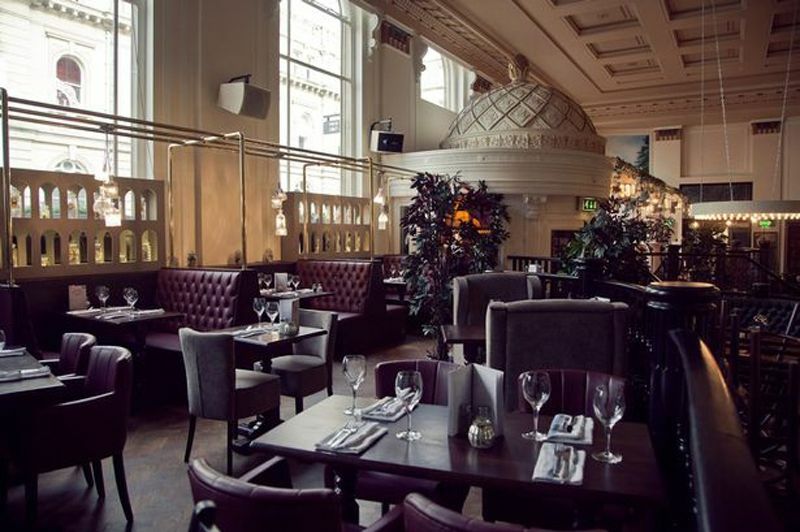 Throughout the establishment you’ll find hints and suggestions of a secret room. This is the drinking den. Further more this is inspired by stories of Hettie’s secret room. Where she would keep her new botanical finds on returning from her travels abroad. 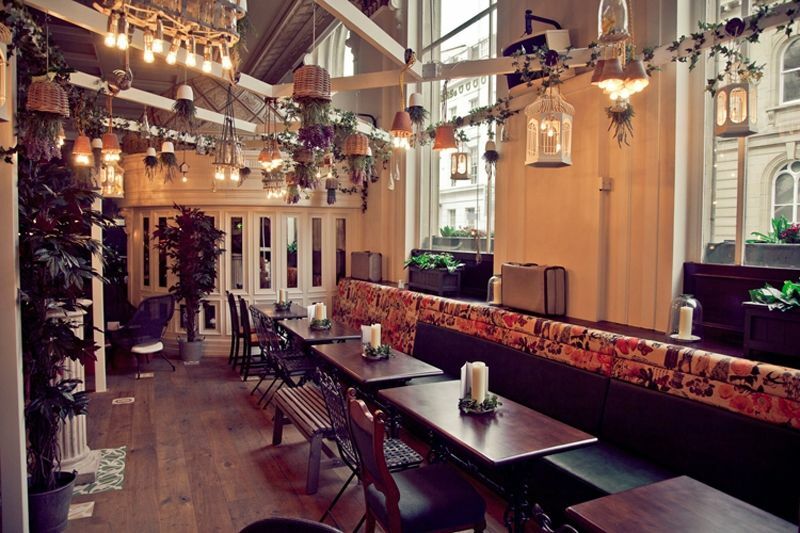 Situated behind a pretend bookcase, a cosy and intimate bar welcomes you. Further more a striking neon sign is displayed amongst antique style suitcases atop the bar area. 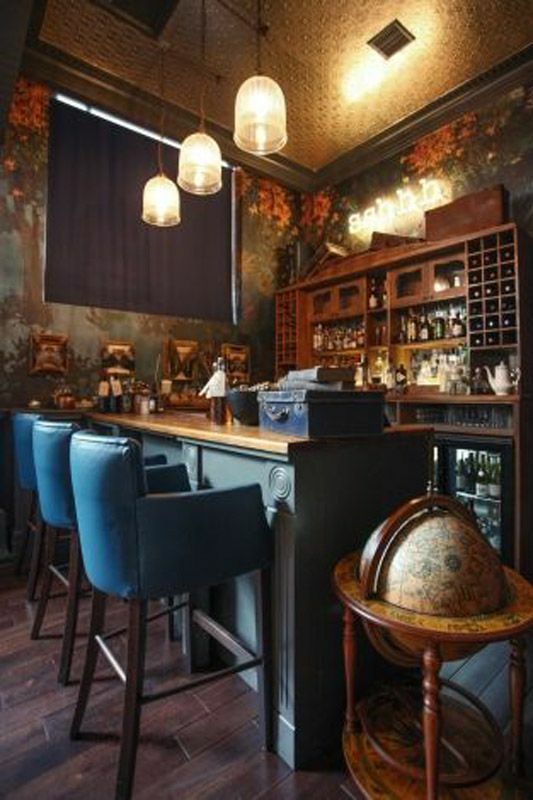 Whilst the walls boast a stunning bespoke floral design of blue and pink hues. A collection of unusual lighting such as a magnificent cluster pendant of white porcelain shades hanging central. As a result traditional fringed shades add to the intimate atmosphere. This is such a beautiful gem. In addition the décor gives and almost whimsical notion. Hettie’s stories make for great reading. Whilst enjoying one of their yummy cocktails on offer. To get the look keep furniture and accessories as natural as possible. Plants and foliage are a must. Consequently add botanical elements. Add antique finds in rustic golds or earthy woods. Choose warm exotic colours such as plum purples. Also pinks, teals and oranges. Add unique and quirky lighting to keep the magical notion alive. You can also check out our Instagram page for even more inspo.